The Lite 3D Viewer is a Parallel Format (side-by-side) Print Viewer made of card paper. It also works well as a Computer Monitor Viewer for medium sized images. Cheap, lightweight, foldable and mailable, it folds flat to the thickness of its lenses (7 mm) and fits into a 4R (4 x 6) photo album sleeve. It is suitable for viewing 3R and 4R (optimum) prints, and 5 - 7 inch wide images on a computer screen. Left: Loreo Lite 3D Viewer made from plastic coated card paper with the inside surface printed black to create the dark viewing chamber. Loreo hopes to enable 3D enthusiasts to send 3D prints and images to friends and family along with an economical viewer to view them with. This handheld viewer also makes it easier to view prints in photo albums, instead of having to pull them out and put them in the deluxe viewer. It is also suitable for viewing side-by-side images produced by other 3D devices, such as twinned cameras, Stereo Realist, Cha-Cha etc. The Lite 3D Viewer has gone through many design stages and was tested by many people at each stage. In order to further improve its compatibility with 3D image formats and types of vision (e.g. long-sightedness, short-sightedness etc. ), many 3D enthusiasts around the world were invited to help evaluate the prototype. A comprehensive prototype testing website was set up to allow participants to input feedback in a structured form. Thanks to the effort and participation of everyone involved, the prototyping of the Loreo Lite 3D Viewer was a great success. Many useful, and often unexpected, observations were made by prototypers, which have contributed greatly to improving the product. Loreo offers a special word of appreciation to Melissa Belvadi, Boris Starosta, Anthony Sousa, Mike Ihde, Francois Beaulieu, Mike Galazin, Douglas St. Denny, George Lin, Andrew Hurst, Jeremy Hinton, Bob Aldridge, John Rupkalvis, Michael Georgoff, Duke Martian, Norm Lehfeldt, Shilo Teshima, Alvin Hui, Shahrokh Dabiri, Abram Klooswyk, Tony Schapps, John Billingham, Michiel Keller, Theodore Gray for their useful comments and constructive criticism. Thanks also to Boris Starosta who kindly provided excellent line art illustrations for the instruction panel and viewer case, and Kazutoshi Otani who helped coordinate distribution of prototype viewers to 3D enthusiasts in Japan. The Loreo Lite 3D Viewer!! told the stereoviews were a big hit with all that had a chance to see them. The Lite 3D Viewer is perfect for sharing views. I'll be ordering more soon. 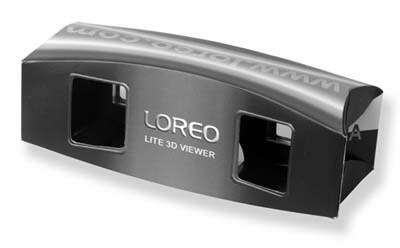 The LOREO Lite 3D Viewer is a product of Loreo Asia Ltd.